Weather-beaten, sake-bearing snow lady or servant to the Goddess of Cosmetics? It all depends on who ask when you are dealing with Oshiroi Baba – The Face Powder Hag. What Does Oshiroi Baba Mean? Oshiroi Baba uses the kanji 白粉 (oshiroi; white face powder) + 婆 (baba; old woman, hag). The word oshiroi specifically refers to the white face powder used by geisha and maiko. Her name is pretty straight forward, and leans towards the Goddess of Cosmetics definition of this yokai. What Does Oshiroi Baba Look Like? No matter which definition of Oshiroi Baba you prefer, she always looks the same. An ancient woman with a back severely bent by age, she leans on a bamboo cane. She wears a ragged kimono and a massive, straw umbrella hat covered in heavy snow. In her hand is a bottle of sake, usually a classic ceramic tokkuri. Her face is covered in oshiroi powder, often slathered on without delicacy or care. By some accounts she drags a mirror behind her, which clangs and rattles in her wake. The mirror, however, is almost always heard but not seen. Few depictions of the Oshiroi Baba include this detail. The source for Toriyama’s picture and story are not known. In fact, even this so-called “Goddess of Crimson Cosmetics” Shifun Senjo appears nowhere other than Toriyama’s prescription. Draw what conclusions from that as you may. 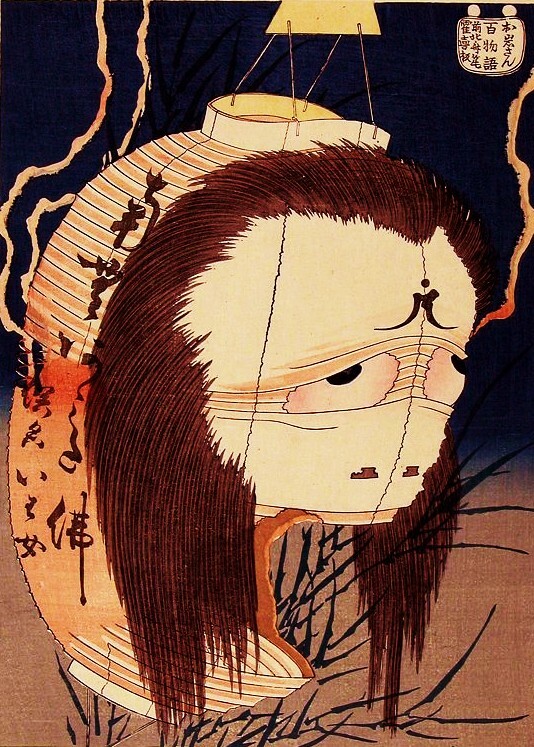 Another legend of the Oshiroi Baba supposedly comes from the Noto Peninsula in Ishikawa prefecture. 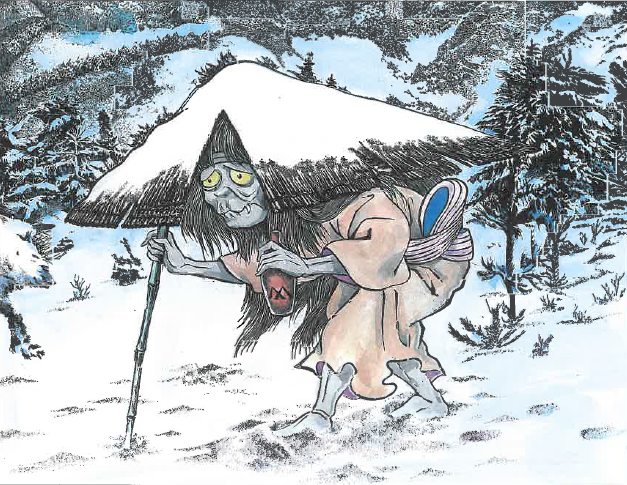 The story tells of an old yokai woman who comes out during heavy snow storms bringing hot sake to those in need—like some alcohol-bearing Santa Claus. This story comes from folklorist Fujiwara Morihiko’s book Zusetsu Minzokugaku Zensho(図説民俗学全集; Complete Illustrated Work of Folklore). 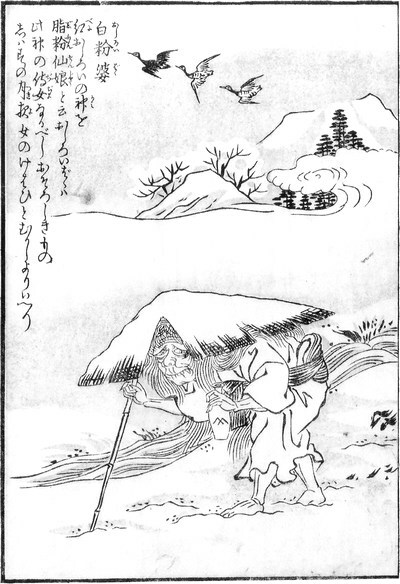 Fujiwara describes the Oshiroi Baba as analogous to the Yuki Onna. However, there is no supporting evidence to Fujiwara’s claims, and subsequent folklorists have been unable to find any such legends from the Noto Peninsula or elsewhere. 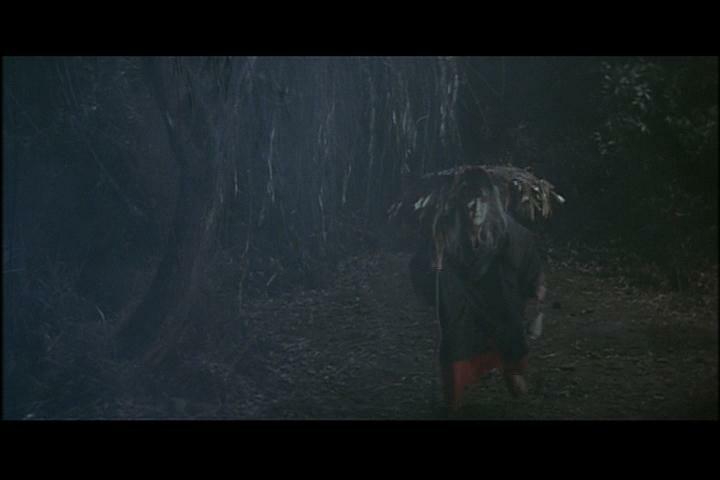 Oshiroi Baba from the film Yokai Hyakumonogatari. Image found on this site. A further story of the Oshiroi Baba comes from Hasedera Temple in Nara prefecture. It has been sourced back to the Muromachi period, and has little in common with other legends. In the 6th year of Tembun (1537), Abbot Koshin of Hasedera Temple had an idea to help the war-torn state of the nation. He would assemble artistic monks from across the country to paint an image of the Goddess Kannon—an image on a sheet of paper as large as the Hondo main temple itself. Unfortunately, the army of the Ashikaga shogunate came into town at the same time, and requisitioned all of the provisions that were supposed to go to feeding the artist-monks. With the food all going to the soldiers, the monks were starving and were unable to complete their painting. They pleaded and prayed to Kannon to give them the means to finish their great work. The next day, a young monk spotted an unknown young woman washing rice down at the local well. She pulled rice from her bucket, washed and ground it on a stone, then set it into a plate to dry. The strange thing was, her bucket never seemed to empty. So long as she left a single grain behind, the bucket would magically refill with rice. Soon there was enough rice to feed the entire Temple. The young monk was amazed, and felt this woman must be an emissary of Kannon, if not Kannon herself. But as she was bent over her work, he could not see her face. And the young monk desperately wanted to see her face. He came up with a plan and lobbed a small stone at her back. As she looked up, he saw her face glowed with a holy light. Her skin was snow white, and looked as if she were made of oshiroi powder. And in spite of the young appearance of her body, her face was deeply lined as if she felt all of the worries of the monks of the world. Fortified by this miracle, the artist monks were able to finish their portrait. In gratitude, they enshrined the Oishiroi Baba and built a temple in her honor. This temple can still be seen on the grounds of Hasedera Temple today. My theme for December is snow monsters, so of course the first one I pick isn’t really a snow monster! Well, I suppose it all depends on which legend you prefer. There is very little background on this yokai, and most agree that it was invented by Toriyama Sekein and that others have attempted to fill in the blanks ever since. Why he would draw an old woman in the snow, then make her the servant of some mysterious Goddess of Cosmetics, is a mystery. Not to mention the fact that she is clearly carrying a sake bottle and not some sort of cosmetics palette … ah well, no one every accused Toriyama of making sense. Personally, I like the sake-bearing snow yokai who bounds up like some sort of magical St. Bernard dog or Santa Claus and pours hot sake down the throats of those in need. I think it suits the image best. But then I also love the story of Hasedera Temple, as that was a temple I spent quite a bit of time at when I was a JET in Nara prefecture. I heard the story of the rice when I was there, but never connected it with the Oshiroi Baba until now. I enjoyed reading your post about Oshiroi Baba. I live and work part of the year as a kurabito in a 314 year old sake brewery and these tales of snow ghosts are fuel for my imagination. Because of the real and imagined benefits that sake, sake kasu, koji and related products and by products have for the skin, Oshiroi Baba, clinging to her sake and dragging an unseen mirror, but always heard mirror, is a cautionary tale. “We all grow old, so don’t be vain and hold onto youth, lest you grow to be an old hag” is one lesson; but why make such a figure the Goddess of Cosmetics? Should such a goddess be Venutian? Or perhaps there is some point being made about the ephemeral nature of youth and beauty? I see it as prescient commentary on the cosmetics (and it’s industry). Take that, Revlon! Interesting! I hadn’t heard of the connection between the mirror and the vanity of youth! When doing my research, the mirror just seemed like something tagged on (notice it doesn’t appear in either of the illustrations) but that makes much more sense with the cosmetics theme. And that is fantastic that you work in a sake brewery. I am a fan of the ol’ nihonshu myself!